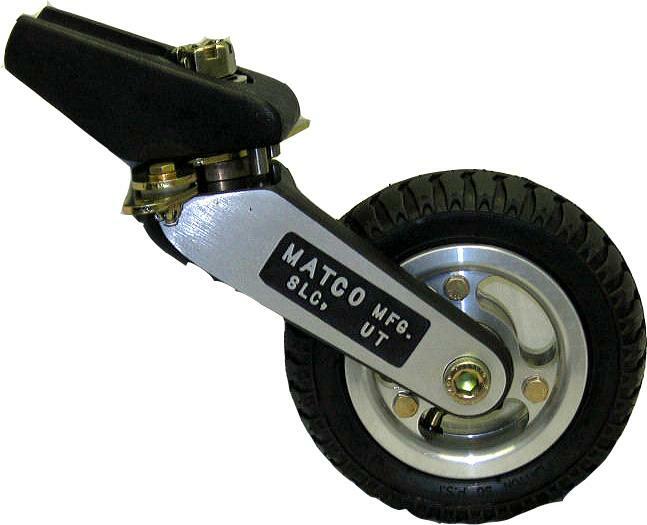 MATCO mfg produces an superior six inch tail wheel for use with tail dragger aircraft which require a light weight tail wheel--the T-6P. New for 2009 is the 90 degree valve stem for easier filling! The T-6P tail wheel has a six inch pneumatic tire and an overall length of 10.00 inches. Maximum width of this tail wheel with fully splayed arms is 9.29 inches and overall height is 9.71 inches. This assembly with pneumatic tire, tube, and wheel weighs 4.75 pounds. The T- 6P tail wheel has a .625 precision sealed ball bearing which is rigorously tested and designed to resist bearing fatigue providing a long bearing life. The pneumatic tire provides a most silent and smooth ride even when compared to our already smooth WHLT-6 solid wheel model. The arms and wings of the tail wheel fork assembly are composed of 4130 which is heat treated to a Rockwell 38-43 to ensure strength and are irridited to prevent corrosion. The tail wheel base and forks are cast and then black anodized to prevent corrosion as well. The T-6P has a 3.5 inch aluminum wheel that uses a 6 inch pneumatic tire & tube and has an operating load of 250 pounds. The replacment tire and tube set is part number TIRT6X2ASY.